See that picture? There’s something missing: Fred. 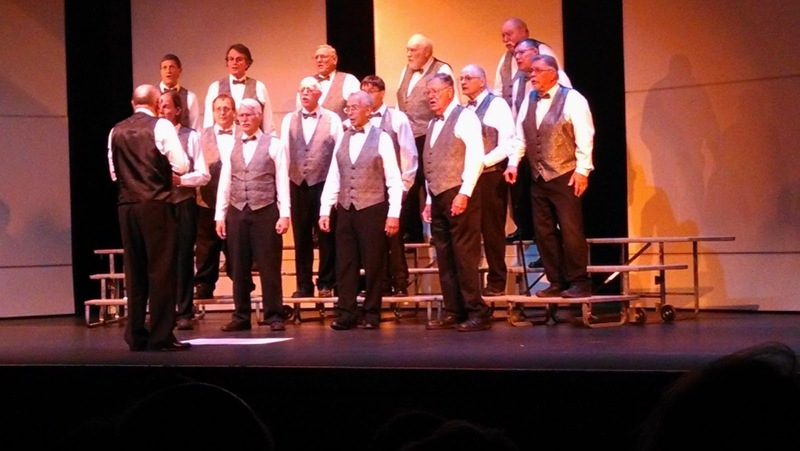 My husband sang with the Coastal Aires barbershop chorus for seven years. He had a rich bass voice, and he loved to sing. I have mostly avoided the group’s concerts the last few years because they bring back so many memories. I can still feel Fred resting his hands on my shoulders as I fastened his bow tie. I can hear him practicing his “bum bum bum bum’s.” And, as I watched the chorus yesterday, I could still see Fred standing in the back row to the right of his buddy Roy, the white-bearded guy who looks like Santa Claus. When Fred got too sick to sing with the Coastal Aires, we still attended their concerts. We’d sit in our favorite back row seats at the Newport Performing Arts Center, and Fred would sing along with every song. Alzheimer’s made it hard for him to deal with sheet music, schedules or knowing where to stand, but it never took away the music. I’ve been missing my guy a lot lately. My life is good. I know he’s been dead for three years and out of the house for five, but I often think about what it would be like if Fred were here. Sometimes I feel a pain that runs from my chest down to my guts. It will never show up on an x-ray, but it’s there. For those who have not lost a loved one, God has blessed you. Those who have know that it doesn’t matter how many years pass; you’re still going to miss them. The concert brought back other memories, too. Joining the men was a women’s group called Women of Note. The eight women do mostly a capella (unaccompanied) harmony. I was an original member when we were called Octet Plus. Now the only remaining original member is the director, Mary Lee Scoville. The current group of women sang so beautifully I wanted to join their fan club and buy their CD. I remember what it was like feeling our voices merging so perfectly that the high, medium and low notes formed a perfect braid of sound that resonated through the building. There’s nothing like human voices singing together. It was a musical day. I sang with the choir at church, attended the barbershop concert, scooted to our South Beach jam session for two hours of folk, country and whatever, ate a quick dinner and settled in for the Tony Awards on TV. A good day, but I wish Fred had been there to share it. I hope he heard the music from wherever he is. The Coastal Aires sounded great, especially the basses. Well I wrote this before and lost it. Sue your words made me cry. I'm sure Fed heard every note and was singing along not missing a beat. I remember once we were in the lobby during intermission. You took a bathroom break while the Coastal Aires were on the stairs doing their thing. Fred was holding my hand and singing along happily. The basses are great, but not the same, without him.